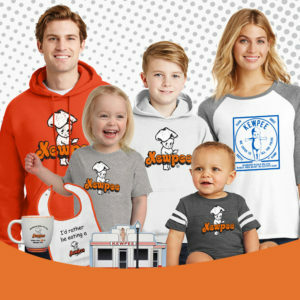 For and gifts and collectibles ordered online, we are happy to announce you can now “pick up” your Kewpee apparel order! If you choose “Customer Pick Up” you will be notified via email when your order is ready for pick up. Production time is 10-15 working days. We have chosen an off-site store format to fulfill our orders as we want to keep our restaurant experience just that, as a restaurant. It is our goal to not complicate or slow down the food ordering process. Thank you for your support and understanding! The items that you have grown to love are available for purchase at either of our three location. East, West and Downtown. These items are perfect for yourself or a gift for a loved one. We now have a wide variety of apparel and collectibles available online including a variety of Men’s and Women’s shirts. Children’s clothing, accessories and collectibles are also available from the online store. The prices offered in the online Store and in our retail stores may differ because the Site and stores may choose to offer items at different prices. 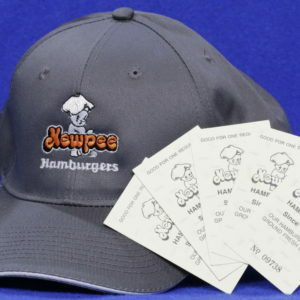 These may run different promotional events at different times. For this reason, prices and promotions (e.g., promotion codes or free shipping) offered by the online store may not always apply in stores. Store prices and promotions (e.g., coupons or additional discounts) may not always apply on this Site, unless otherwise stated.